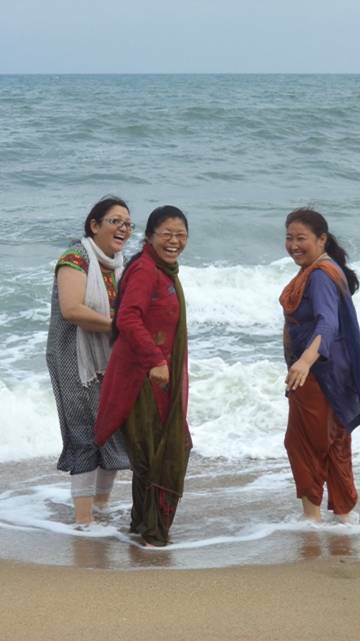 MESH: From Ladakh in the north to Pondicherry in the south. 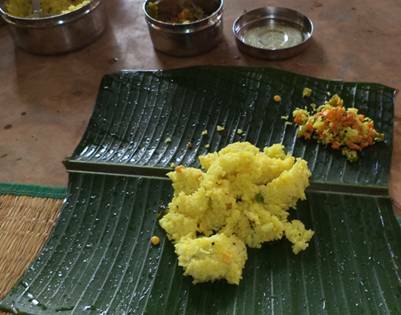 Well paper was started by Danny and Orley at the time when Tsunami hit Tamil Nadu. 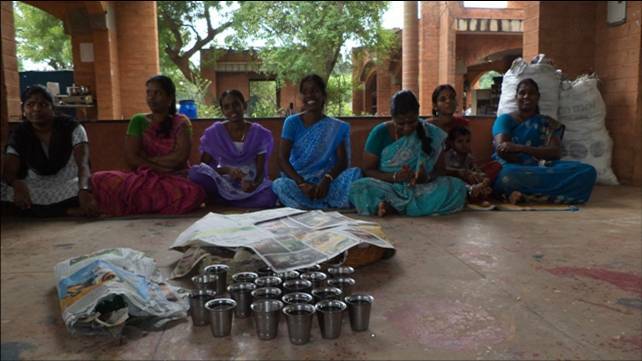 They decided to come up with some project which will empower women to form into groups and make a livelihood and form small SHG and sustain their livelihood. •	A new one called Shree Esther which is 7 months old. 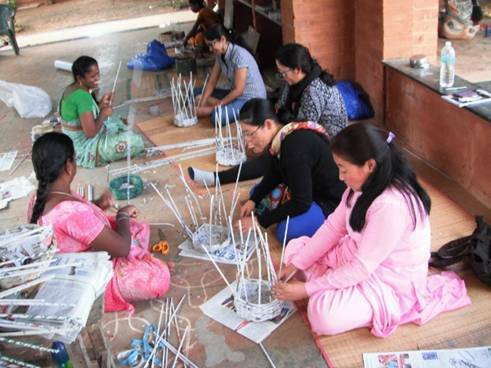 WELL PAPER makes all kinds of different products ranging from coiled paper bowls, pen stands to a wide variety of paper baskets, fruit baskets and laundry baskets and a lot of jewellery, elephant toys, nut bowls, bangles and the interesting part of all is they have a zero waste policy. It is amazing to watch them trying to use each and every tiny bits and pieces of plastic, cardboard, paper. 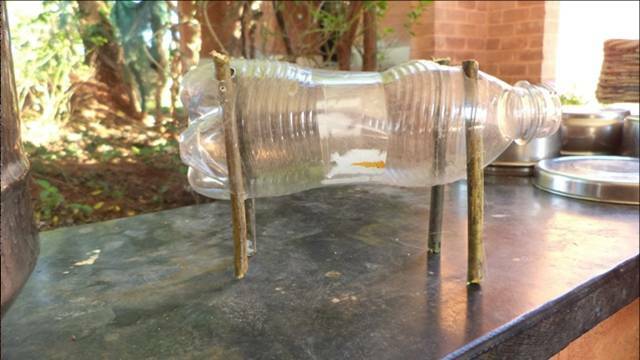 It is so ecologically friendly and seeing the products makes you SAY ‘’are they really made from paper, plastic and cardboard’’- amazing up cycling of products from waste into a beautiful product. We have asked Zeevic Peretz if he could give a training for the Pagir group in Leh and since it’s very cold and unsuitable weather now to go to the Leh which is in the high Himalayas we decided that it is best for the Leh artisans to go down to Pondicherry to learn what WELL PAPER does and grasp some knowledge and ideas and see how they can implement these skill and interpret their learning’s. 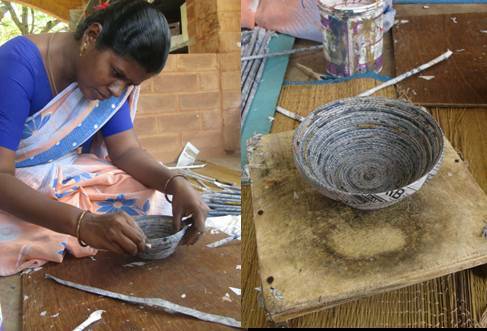 We spent in Jayam group learning how to roll and coil paper under the supervision of Devi and her team who explained to us briefly about their group and what they do and how they do, simultaneously teaching alongside their work on how to roll paper and make coiled bowls and earrings. 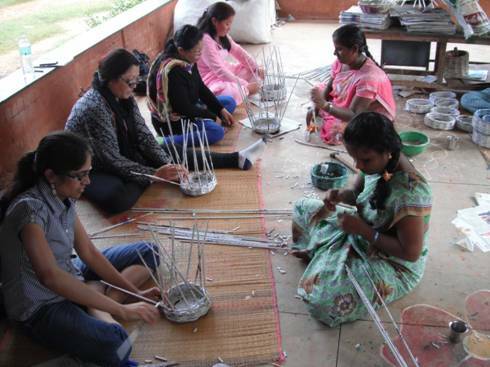 We were introduced to the basket weaving group called Shree Mother, where we learnt and got used to making nice rolled paper which were later used for making baskets and pen stands. 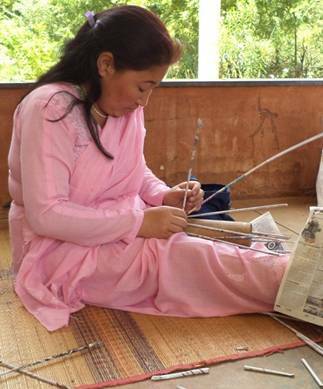 Basket weaving is tough, one needs to have a strong hand to hold and bring the shape of the bowl right and making sure that you are not pulling tight so the bowl does not curve inwards...minor details count and they pronounce the good work on quality issues. We were finally at the Papier-mâché unit called Shree Esther group. This group is 7 months old and was supported by Ms. Esther who passed away a year ago due to some illness. Shree Esther group is named her. 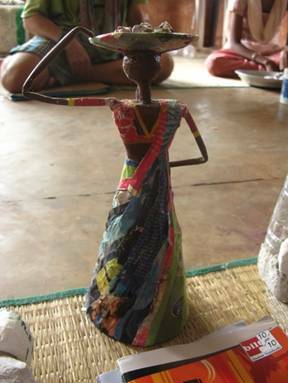 they work on papier-mâché products, using paper, plastic, cardboard and any natural substance which can be utilized and made into a product. It is amazing to see what they use and what they make from them. 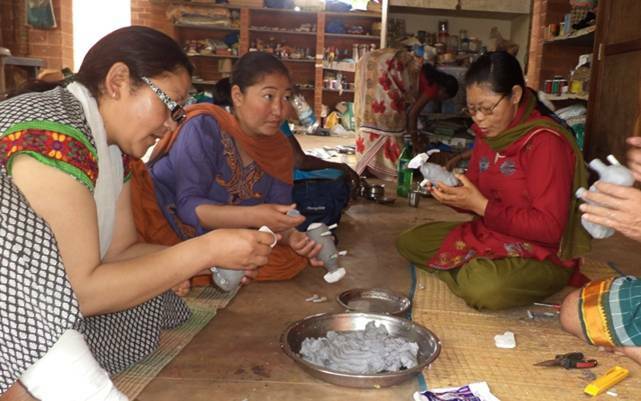 Zeevic was our teacher along with the group members who taught us the process of making paper pulp and what the next procedure is, and also how to make the pulp soft and tender so it is good to mould when making products and how to smoothen it off. It was interesting and fun making the products, sitting down like small children and working from scratch to make our own toys and products. 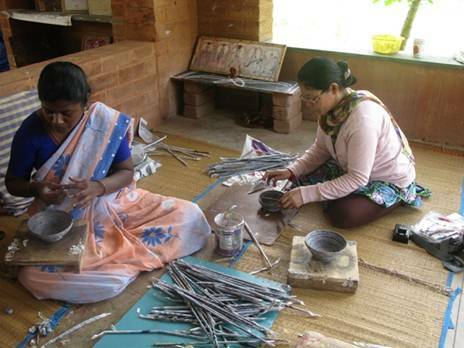 We have seen many other products made from waste like ear rings from bottle cap rings, ear rings from mango seeds. 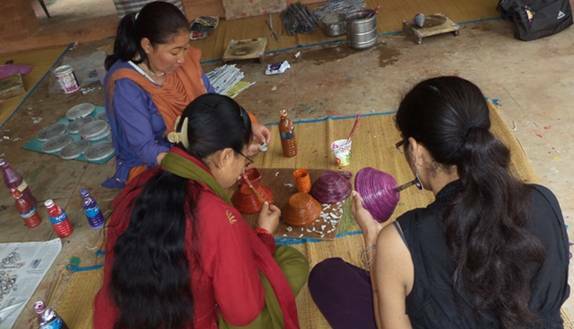 We spent painting our coiled bowls, woven baskets and finishing the papier-mâché bangles and bowls and yaks to let them dry with second layer of papier-mâché. 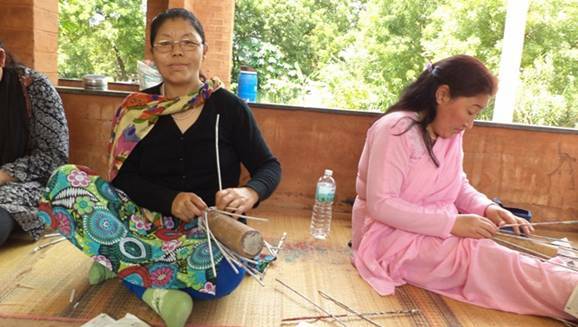 It was a real test of skills to practice a new craft for the artisans from Leh. 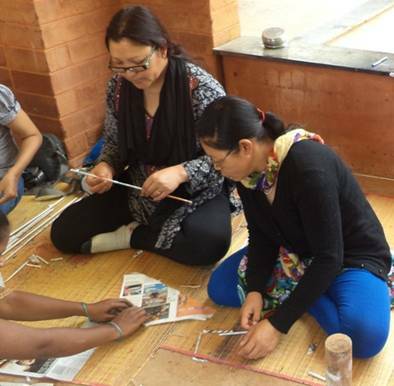 Pagir group (in Leh), has been doing a lot activities to clean up Leh, making paper bags for stores in Leh and also taking all the tailor's waste from Leh and recycling and up cycling it by making beautiful small stitched products. They have been doing a few things with Papier-mâché but it is still crude and they have no specialised skills in the craft so this training has enhanced their skills and introduced different types of products that they can develop using rolled paper and through papier-mâché, and using bottles, glass, plastic and cardboard. The ladies from WELL PAPER are amazing at sharing so openly their craft with us and teaching us all the different skills involved in different product making. We really appreciate and thank them for allocating their precious time and teaching their craft to us and especially for their hospitality tothe Leh afor all their beautiful, cheerful smiles every day and also the arrangements for the accommodation. 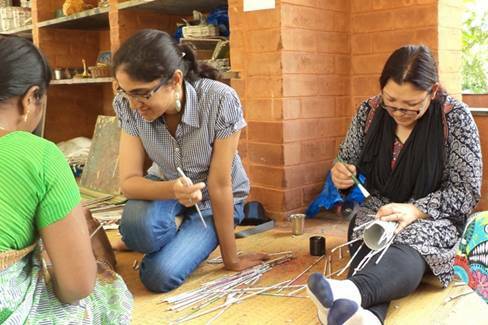 We all really enjoyed their stay in Auroville learning so much more than we expected and we also enjoyed the trainers as they were very helpful and watched over all our faults and tried to correct them and taught us beautifully the arts of coiling paper and weaving and Papier-mâché. It was the first time for Tsering Chondal to go on a train on a long journey from Delhi to Chennai. 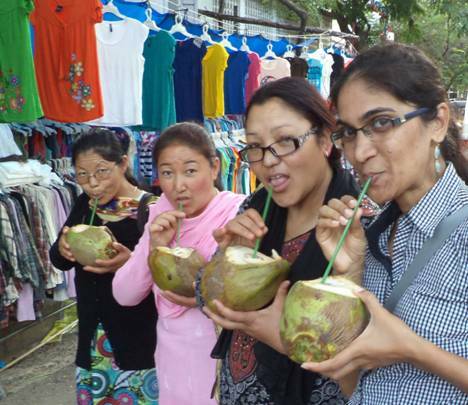 It was the first time for all three Leh women to see the sea to see the sea; to see coconuts growing on trees and drink tender coconut water. They even saw a snake for the first time. The women from Leh have promised to implement whatever they had learnt when they get back home. They are also looking forward to Zeevic’s trip to Leh so he can teach them more craft and spend more time in designing for Pagir. Many thanks to IM Soir and SIDA for project funding which made this lifetime experience and learning possible.